A dagger can be both a great weapon and an impressive accessory for any warrior. Our Double Edge Damascus Dagger includes a brown leather sheath which makes it easy to transport and access. It features a simple guard and pommel making it a perfectly versatile weapon to pair with any outfit. This knife features a black leather wrapped handle. 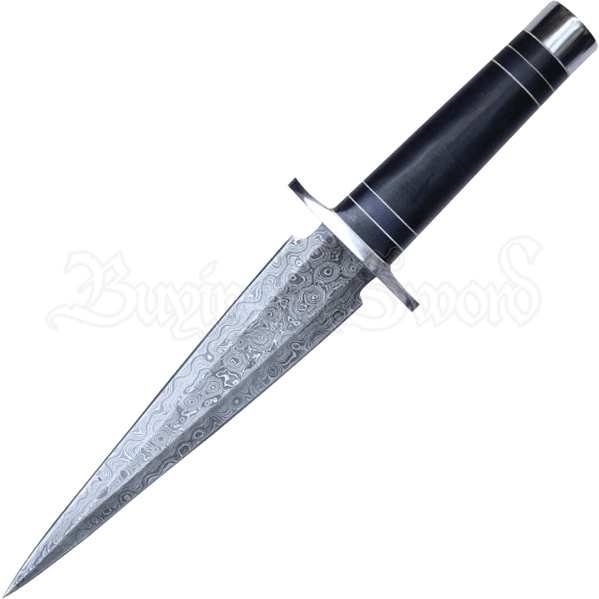 The craftsmanship here is remarkable, as the blade has been folded several times to create 250 layers in the metal, giving it a distinctive Damascus pattern. Few daggers compare to a blade this ornate. The distinctive design of this dagger makes it a great side-arm for any weapon enthusiasts in the market for an eye-catching blade.